As a beginning student, you will not need a great deal to train in: just something loose and comfortable. In Canberra's summer, t-shirt and shorts should be fine; in winter, perhaps a track suit, until you get warm! 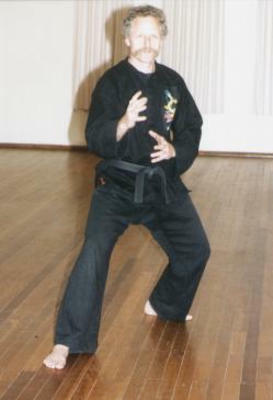 After a couple of months, new students are expected to purchase a uniform - this consists of the Pai Lum t-shirt or a Kung Fu jacket, Kung Fu pants, and a Dragon Patch. . Dragon Patches are either worn on the bottom of the left leg of Kung Fu pants, or on the left breast of the Kung Fu jacket, over the heart. Pai Lum tracksuit tops should be worn in cooler weather as part of the Uniform. As you will be interacting more with fellow students when you have been promoted to the level of White Sash, male students should wear groin protection at all times, and females may need chest protection. For sparring (White Sash and above), shin and instep protectors, mitts, and mouthguards must be worn. As a White Sash, you will also be entitled to purchase a Dragon Ring. All members receive a Pai Lum sleeve patch and badge. Additional or replacement ones can be purchased. 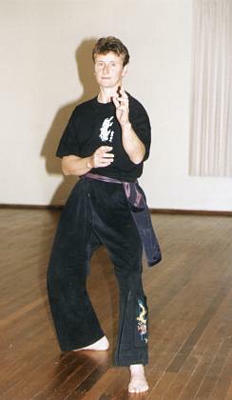 Kung Fu slippers or shoes can be worn, but students will generally train in bare feet. This encourages more precise foot orientation in both stances and kicks. For Dragon Patches, Dragon Rings, sleeve patches and Pai Lum t-shirts and tracksuit tops, see your instructor. Your instructor will also be able to obtain uniform and training equipment for you at some discount off standard retail prices. Note: For students who are lovers of dragons, brass dragon plaques are also available on request.